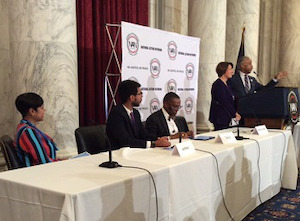 WASHINGTON – Voting rights, education, health care, economic uplift and criminal justice reform are key legislative policy issues that the public should support as a new Congress is seated in January, according to speakers and panelists at the legislative and policy conference hosted by the National Action Network. The two-day gathering at the Russell Senate Office Building, which began on the first day that Congress reconvened following the national midterm, is the first such event by a national civil rights group post-election. A laundry list of senators and representatives – Bernie Sanders, Cory Booker, Benjamin Cardin, Frederica Wilson and Joyce Beatty, to name a few – are scheduled to take up issues of education, immigration, homeland security and the first 100 days of the 116th Congress on Wednesday. Organizers and guest speakers called on the more than 300 attendees Tuesday morning to follow up voting with support for policy initiatives on the horizon that help their communities. Attendees also were urged to visit the offices of lawmakers on both sides of the aisle – time was built into the conference schedule to do so – to let them know the policy matters and legislative initiatives that are important to the public, and to hold them accountable when it’s time to vote on legislation. A number of lawmakers spoke about legislation and policy initiatives they consider key, including representatives Al Green and James Clyburn and senators Amy Klobuchar, Elizabeth Warren, Kamala Harris and Mark Warner. Norton said she believes the incoming Congress will be the one that finally helps the District of Columbia gain statehood, and her a vote on the House floor on behalf of its 700,000 residents. She urged attendees to be vocal and active in promoting policies and holding lawmakers accountable, sounding a common theme. Restoring protections to the federal Voting Rights Act is imperative, said Rep. Terri Sewell from Alabama. “We’re seeing a systematic effort by this administration to take us backwards,” she said, citing changes that made it easier to purge voter rolls and other practices that she and several speakers described as voter-suppression tactics in some areas that particularly disenfranchise Blacks, Hispanics and Native Americans living on tribal lands. Speakers also stressed the importance of participating in the upcoming U.S. Census because the numbers directly influence representation in Congress and allocation of federal financial resources. The U.S. Commission on Civil Rights is looking at prison issues, as well as excessive police force, civil rights of Native Americans and voting rights, said Catherine Lhamon, the agency’s chair. Voting, redistricting and the 2020 Census were the focus of a panel discussion moderated by Tiffany Cross, co-founder and managing editor of the political diversity blog, The Beat DC. “Considering everything Democrats had going against them, Tuesday was exceptional,” said Jose Morales of the National Democratic Redistricting Committee, calling Republican gerrymandering a form of voter suppression. Panelists and speakers praised the diversity of new legislators who will be taking office, with Native Americans, Muslims, LGBTQ candidates and a record number of winning female candidates making history. “We’re very excited to see this diversity coming to Congress,” said Rhonda Foxx, chief of staff to Rep. Alma Adams, D-N.C.
She called on voters to engage lawmakers about diversity on their staffs, noting that only one lawmaker outside of the members of the Congressional Black Caucus has a Black chief of staff. “Ask legislators, ‘What does your staff look like?’” Foxx suggested. It’s important to get acquainted and develop relationships with lawmakers’ staff members because they have influence, and some know the institutions and the ins and outs of government better than the lawmakers themselves, said David Johns, executive director of the National Black Justice Coalition. Johns urged attendees to include in their advocacy people who find themselves at the intersections of various identities, and to seek to influence legislators on both sides of the aisle, which may mean getting outside of a personal comfort zone.